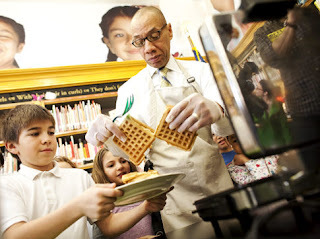 NYC Schools Chancellor Dennis Walcott will not let natural disasters deter him from his mission. Kids must sit in school as long and as much as possible. Living through a disastrous hurricane never taught anyone anything, he reasons, and kids must make up the time they'd have spent preparing for standardized tests. After all, the more time they spent in school, the more circles will be correct, and the more likely it will be that his boss, Michael Bloomberg, will have achieved his divine mission to get those circles in the right places. And that is the only thing that matters. If the circles are wrong, they can close schools. They can exile teachers to the ATR. They can undermine neighborhoods by cutting school space and dumping private charters into them. But eventually, if those circles aren't in the right places, someone will blame Bloomberg, and that is absolutely unacceptable. What the hell do those losers expect? He's only been at it for ten years, and it takes time to accomplish these things. So we'll just order the teachers back to work. After all, they've been having big fun all week, sitting in the dark and freezing with the rest of the bridge and tunnel crowd, in Queens, or Brooklyn, or whatever those places are called. And we gave them a raise three or four years ago. What the hell are they always whining about anyway? So what if all the other city employees got 8% between 2008 and 2010? They deserved it! It's not their fault kids don't know where to put the circles! So, we will negotiate with the UFT. They're always talking about getting a seat at the table, so we'll give them one. And we're flexible. We're willing to call them back for four days, but if that's not acceptable we'll call them back five or six. That's why we negotiate. But nothing will stay between us and those circles! If we have to buy another term to get them in the right places, so be it!